These aren’t your average potstickers! I’m a big fan of potstickers. I love eating them at restaurants and at home. I find the Costco frozen section sells a lot of really tasty Asian-style appetizers (including some great potstickers). I really like the Minh Pork Egg Rolls as well as the Siwin Chicken and Vegetable Dumpling Potstickers. I’d never had beef potstickers before though, so that’s why I wanted to try these Bulgogi Beef Mandu from Bibigo when I saw them at Costco. Bibigo also makes the Mini Chicken and Cilantro Frozen Wontons that are sold at Costco (and they seem to be a popular product). 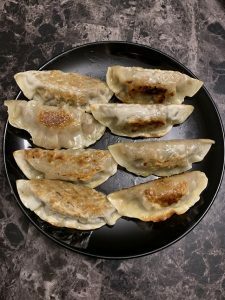 The Beef Bulgogi Mandu are similar in that they’re a dumpling-type dish, but otherwise they’re very different than the Mini Fully Cooked Chicken and Cilantro Frozen Wontons. First of all, these are not your average-sized potstickers; they’re a fair amount bigger than any other potstickers I’ve had, and packed full of Korean-style beef bulgogi. The beef itself is ground beef, which surprised me as I thought it would be sliced beef. The ground beef mixture is encased in a delicious, thin, flour dough wrapping that gets nice and crispy in the pan. There’s tons of flavor in these and you don’t need any additional sauce on them in my opinion (which isn’t necessarily the case with some of the other potstickers I’ve reviewed). They have a smoky, grilled flavor and you can taste flavors like soy sauce, garlic and sesame oil in the ground beef. The veggies in the dumplings include onion, carrot and cabbage. One thing I don’t love about the taste of these is the greasiness. They definitely taste a lot more greasy and oily compared to chicken or pork dumplings. I think this is mainly due to the ground beef, as ground beef tends to be quite fatty. Anyway, when you cook the Bulgogi Beef Mandu, they become quite shiny and oily. The Bibigio Bulgogi Beef Mandu come frozen and require pan frying to cook them. On the surface, that seems similar to other potsticker/dumpling products I’ve purchased from Costco, but I find these less convenient than some of those other dumplings. It’s difficult to get them to an even crispiness and golden brown color all over. When I’ve cooked these, it usually goes well up until one of the dumplings splits open and grease gets onto the pan from the inside of the split dumpling. Then I find that the grease splatters everywhere and I’m dodging grease bullets. Despite the extra cleanup from the splattered grease, I feel like buying these frozen is obviously a much more convenient option than making them from scratch (which might not solve the grease/splattering problem anyway as a lot of it has to do with the fact that beef tends to be higher in fat than other meats). 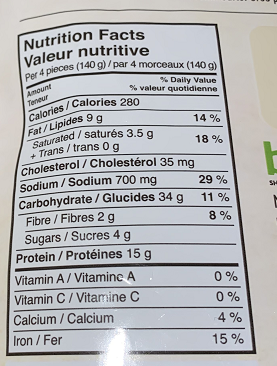 Looking at these from a nutritional perspective, four dumplings contains 280 calories, nine grams of fat, 700 milligrams of sodium, four grams of sugar and 15 grams of protein. I definitely dig the high amount of protein, but these dumplings are higher in calories, sodium and fat than chicken and pork dumplings I’ve had in the past. I will say that I found eating four of these to be quite filling, which may be related to the high protein content. Thus, I found I was quite satisfied with my 280 calorie serving. 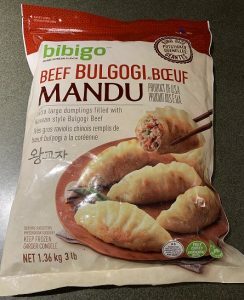 I purchased the Bibigo Beef Bulgogi Mandu from Costco for $14.89 Canadian (full price). For $14.89, you get three pounds of dumplings, which for my husband and I will work out to about four meals (but we usually eat them as a side dish with other things). They’re not the cheapest frozen product, but I really wanted to try them out. Also, when I think about how much a small plate of these would cost in a restaurant as an appetizer, $14.89 doesn’t seem as bad. If they happened to go on sale for a couple of dollars cheaper, they’d be a pretty good deal. Aside from the grease, I enjoy the flavor of the Bibigo Beef Bulgogi Mandu. I wish they were a bit easier to pan fry and weren’t quite so messy, but it was nice to switch it up and have a beef dumpling dish rather than pork or chicken. Overall, I prefer the Costco Siwin Chicken and Vegetable Dumpling Potstickers, but might buy these again if I see them on sale. I’m curious! 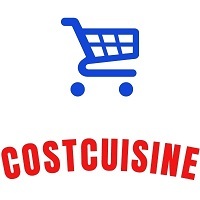 What’s your favorite appetizer or side dish item from Costco? I agree, these are pretty tasty. BUT…the cleanup is riduculous, grease everywhere! I’m glad I’m not the only who experiences this! Have you tried cooking them in an air fryer? We cook the port pot stickers in the air fryer they are a little crispier than if you pan fry but there is no grease. We love it this way. Instead of pan frying them, I baked them in the oven. Stood them up at first, and then turned them on each side while baking. The grease from the beef gave it the pan fried effect without the mess. Possibly healthier as well as no oil or butter was added as you would have to when frying in a pan. That’s such a good tip. I’m actually going to try this with the ones I have left! Thanks! Thanks for your review of these new beef potstickers Natalie! 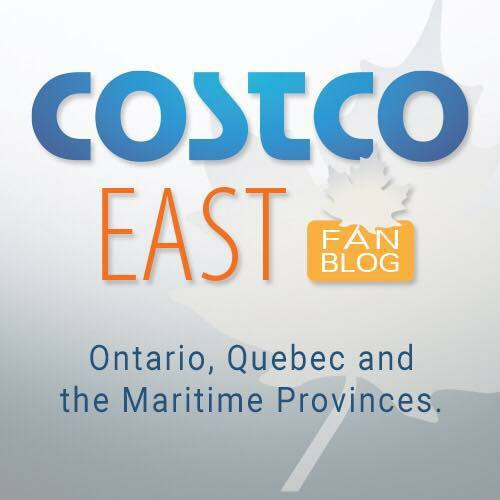 I’ll watch for them next time at Costco…love most Asian-style food. Let me know if you like them! I’m always curious to hear what others think! Do you think a splatter screen would help when frying these? I think that would probably help a great deal! Good idea Debra! I liked the taste, but they were way too greasy. I wouldn’t buy them again. I used air fryer too! And Mandu is crispy and no grease splash on stove. So easy ! I’m full Korean and I buy these for the convenience and flavour than making them homemade. I thaw them out in the fridge for a few hours before cooking and then fry them. By cooking them non-frozen, I find I use a lot less oil and there is hardly any splatter. We also like to steam them which keeps the juices in and is much healthier for the kids.